What are the considerations when designing a sun shading system? The movement toward sustainable building designs is being driven largely by environmentally-sensitive building owners and/or their prospective tenants. As these owners and their consultants weigh their design objectives and alternatives, they often find that exterior sun controls are an ideal part of the "green" solution for their buildings. Exterior sun shading controls can dramatically reduce the air conditioning loads caused by the sun’s radiation penetrating the building’s windows. Indeed, some form of exterior solar shading controls is now part of the country's prescriptive design requirements. In addition to energy savings through reduced cooling loads exterior sun controls can enhance a building’s appearance, as well as provide filtered daylight and reduced glare. Shading system block a certain amount of the solar radiation from entering the building. They are ideally designed to maximize natural daylight while controlling solar heat gain and glare. We offer an extraordinary range of sun control products from static aluminium, to fully automated louvres covered with electricty-generating photovoltaics. The sun rises in the East and sets in the West. The sun travels in an arc, reaching its highest altitude either in the North (during the middle part of the year) or in the South. 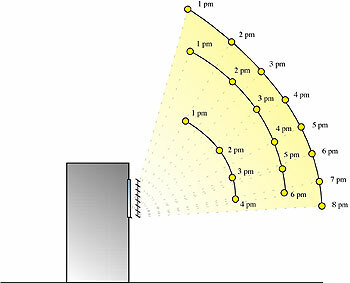 Controllable fins, unlike fixed, can hang vertically in front of a window and still optimise solar shading and visibility thanks to specially written computer software which controls the louvers to follow the path of the sun. 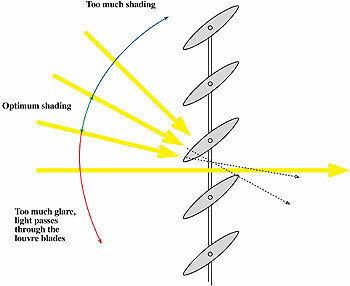 Controllable solar shading systems reduce the likelihood of over-shading or under-shading and will result in the optimum shading angle at all times.